Temperament: Very friendly and affectionate. Miley was discovered stray, hungry and full of ear mites by a concerned citizen who heard her crying late one night, and went searching for the poor kitten. She took the kitten home and contacted RCR for help in getting her a home. Miley is a confident and outgoing kitten who is all about cuddles and purrs. She loves to tuck herself under her foster mom's chin at night, or in any position as long as she is touching. She has the natural curiosity of all cats but is well-behaved and doesn't get into things she shouldn't. Miley likes soft food and does exhibit some champagne tastes - she stalks her foster mom when the smelly gourmet cheeses come out! 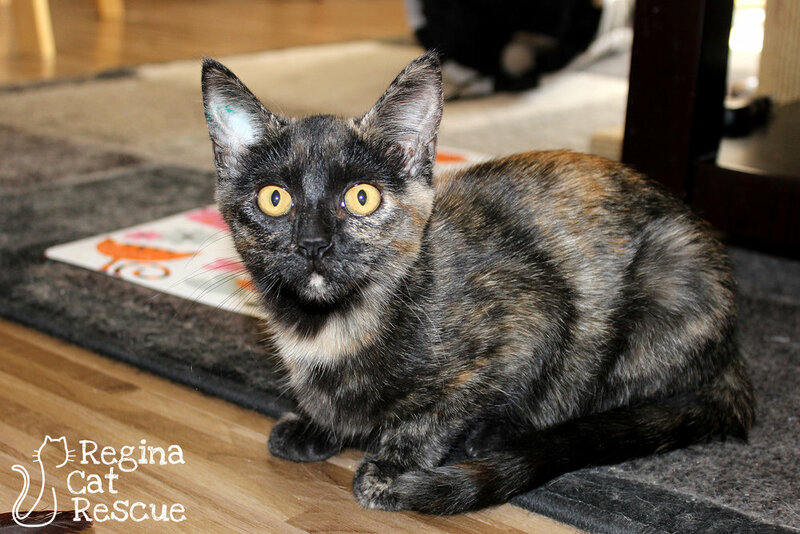 Miley loves to play with cat toys as well as the other kittens in her foster home and would do well as an only cat or in a home with the other pets. She has never shown any signs of aggression to other animals, only affection and while not fostered with children, she has been very good when exposed to them. If you are interested in Miley, click here to view our adoption contract and click here to complete an adoption application or email the RCR Adoption Coordinator at rcradoptions@gmail.com for more info.